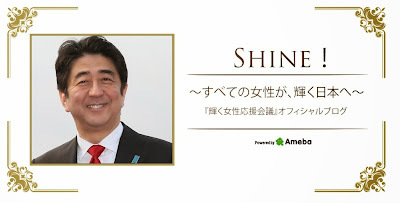 Yesterday Prime Minister Abe Shinzo launched a new blog about the empowerment of Japan's women. No, people are sharing it for the blog title's inadvertent hilarity. "Shine!" is of course supposed to be read as [ʃaɪn] - the imperative case of the English language verb "to shine" -- in Japanese 輝け: kagayake. A not insignificant number of wags are reading the title not as English but as Romaji -- which is to say they are wondering whether or not the pronunciation should be [ʃineɪ] - the imperative case of the Japanese verb "to drop dead" -- in Japanese 死ね : shine. 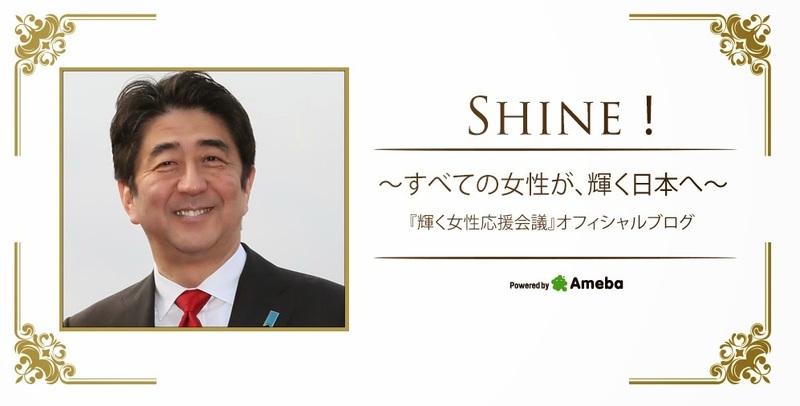 So, women of Japan, your prime minister says unto you, "Shine!" Read it as you will. With the record for the longest-lasting lineup in history firmly under its obi, the constipated release of two excruciatingly unsatisfying plans for change (Third Arrow structural economic reforms and reinterpretation of the constitutional ban on collective self-defense) making its days darker, ministers making apologies to the citizens for having voiced inconvenient truths (Link), the first significant death (Link) and languishing poll numbers(Link) Abe Cabinet 2.0 is starting to look stale. 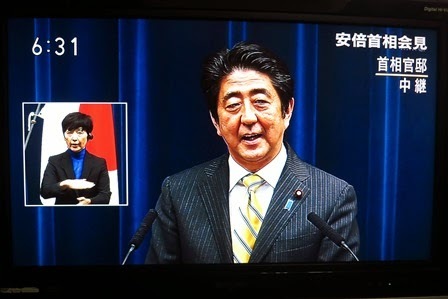 Prime Minister Abe delivered what sounded pretty much like a nationally televised hail and farewell speech last night -- sweeping through and over what the current Diet session and the Cabinet have achieved, giving no inkling of what is on the agenda for the autumn Extraordinary Diet Session. The Yomiuri Shimbun yesterday predicted that the Prime Minister will shuffle his Cabinet in the beginning of September (Link) -- which, based on the PM's press conference, sounds about right. Today the paper has printed an article on the thicket of numbers Abe and his close confidants will have to hack through on the way to that new Cabinet. First is the faction strength numbers. Now, the factions are not what they were in terms of the grooming of candidates and guides for the approximate number of cabinet seats apportioned from each faction's list of eligible candidates. Still, the Prime Minister has to at least pay some grudging respect to the legacy of the factions -- meaning that each faction will supply at least one member of the Cabinet, with the second place Nukaga Faction, the historical rival of the Prime Minister's Machimura Faction, at least two seats. As for Machimura, he has demanded that the faction honor its most senior underachiever -- a sad sack member with 8 elections to the Diet without ever serving in the Cabinet -- with a cabinet post. That last number, 127 members still unaffiliated 18 months after an election, indicates of how far the factions have fallen as institutions. Until the Postal Reform election of 2005, only a handful of Liberal Democratic Party members were independent-minded or obnoxious enough to resist being recruited into a faction. Today, the non-faction faction is far and away the largest faction. 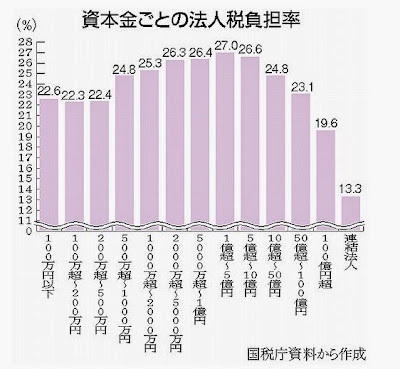 For the Yomiuri, the top candidates for Cabinet posts are party members with at least 5 elections to the House of Representatives (the old standard was 6 elections) or 3 elections to the House of Councillors -- and no previous Cabinet service. Unfortunately for Mr. Abe and his circle of advisers, the interregnum of three Democratic Party of Japan-led cabinets has created a huge backlog in the list of these purportedly worthy candidates. Currently 59 (43 HoR, 16 HoC) Diet members meet the Yomiuri standard -- a major headache for the PM, who wants to keep the number of Cabinet members fixed at 18. With the Chief Cabinet Secretary spot reserved for its current placeholder Suga Yoshihide, the number of Cabinet posts in play is really only 17. A lot of broken dreams on tap here. Abe has a few standards of his own he will want to enforce. He will want to have a larger cohort of women in his next Cabinet in order to preserve the appearance of his support for greater women's empowerment. He has raft of heavyweight candidates to chose from: Koike Yuriko, Noda Seiko, Takaichi Sanae are the first to come to mind. Unfortunately all of them have previous Cabinet service -- meaning that appointing them will make no dent in the ranks of the unfledged candidates. Abe will also want to employ some of his friends and fellow travelers. Takaichi fits the bill in this department. So does of Shisaku favorite Seko Hiroshige -- who has the requisite number of elections to the Diet but heretofore no (Why is this in no way surprising?) Cabinet appointments on his resume. Abe and his confidants have a long hot summer of thinking ahead of them. The process of selecting a new cabinet will probably involve, if anything, a lot of golf games under a blazing hot sun. Look for a toasted Abe announcing a new cabinet lineup ahead of the opening of the Extraordinary Session, with a brand new State Minister for Regional Revitalization post enlivening the festivities. 16:00 Q and A is being extended but I have to go. Too bad. 15:56 Angela Kubo asks a three-part uestion: how did you feel when Suzuki came before you to apologize, have you forgiven him, and do you think Suzuki is sincere or do you believe he was forced to come forward? 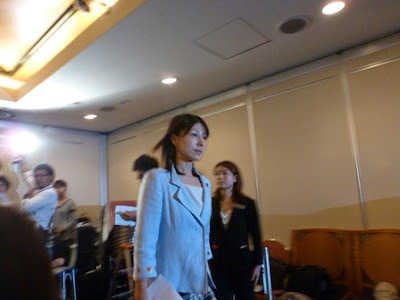 Shiomura was shocked at the apology, has no arranged her thoughts and has not forgiven. She recognizes that coming forward to bravery. As for his sincerity, she does not know. 15:55 Q: What do you think about changing laws to increase an assembly member's ability to identify a person who is speaking slanderously? Shiomura [wisely] says changes to the laws and regulations are a last resort. 15:50 Question about Abe's statement today about creating a society where women shine. Shoimura says it is a nice sentiment but that in Tokyo Assembly, this has not yet taken place. 15:40 French journalist questioner offers his sumpathies as French man. Asks her whether she has plans to run for a Diet seat. 15:36 Shiomura notes that yes, Prime Minister Abe has put women's empowerment at the center of his program. He most likely had thoughts about this incident. She wished she could learn what his thoughts are. 15:31 Questioner Friedrich is surprised that a young (for Friedrich, 51 years of age is young) man was the confessed heckler. 15:25 First question is not a question but a diatribe by newsletter writer. 15:24 Shiomura says she will not let the matter rest on Suzuki's apology. He was the not the only one heckling. end of Shiomura statement. 15:20 According to Shiomura, the [LDP]'s caucus in the Tokyo Assembly would not take action to help in the reprimanding of one of its members. Instead the caucus said to her that she had 3 days to provide the name of the perpertrator -- after that the matter would be no longer actionable. 15:10 She was surprised particularly at everyone laughing and smiling at the loud comments. She had to keep going because she only had 11 minutes. 15:05 Shiomura explains that had been heckled before in committee session but she did not expect such medieval (koten) heckling. She was talking about three subjects: passive smoking, care of dogs and help for women's pregnancy and childbirth issues. She was heckled only during her speaking on the last subject. 15:03 "Thank you for coming here on a busy day"? Stock phrase. Problem: she is talking to a room full of folks for whom coming to hear her speak is them doing their jobs. 15:00 The room is full to bursting, 17 cameras along the back wall. Photographers mob the lectern. "What is so great about being normal?" The editorial, entitled, "Is it bad to do it as a country of special qualities?" ("Tokushu na kuni" de wa dame ka? -- Link - J) finds that talk about Japan's need to become normal began in earnest over Japan's potential and eventually non-participation in combat in the First Gulf War. Japan's payment of 13 billion dollars in cash as its contribution to the international military campaign earned the country almost nothing in the way of thanks. Instead, demagogues and commentators, primarily in the United States, lambasted Japan for its "checkbook contribution." In the reverberations of this seeming diplomatic catastrophe, one that had more to do with Japan's failure to open up its markets to trade than sending its troops overseas, the call arose for a "normalization" of Japan, where governments could use the Self Defense Forces more like a regular military. The most prominent outline for this transition was Ozawa Ichiro's Blueprint for a New Japan, making Ozawa, for a while, the great Japanese hope for the Americans (hard to believe that now, after the Hatoyama premiership). Japan's struggle and need to become normal became a zeitgeist (actually, it has at times all the attributes of a cult). Just google "Japan" and "normal" or "Japan" and "normalization" to see the immense number of hits they generate. The recent debate over the constitutionality of an exercise of Japan's UN-guaranteed right to enter into collective self defense -- a debate that is supposed to wind up today-- has highlighted more what Japan stands to lose in exercising CSD than what it is likely to gain. And this is as it should be. "Normal" is after all, a loaded term. Its opposite is abnormal, a state that no one would want to be in. However, what if by historical accident, a country was at once stripped of its armed forces, like an individual ensnarled in a traffic accident who loses a limb? One can view that country or individual as being disabled, as less than normal. One would, if one completely mad, instill in that country or individual an overwhelming desire to become normal. Or, one could acknowledge that "accidents do happen" and move on, not focusing on the quantities that are lacking but the qualities that are present. Looking upon the individual or the country as "differently abled." There has been a perplexing disconnect between the global consensus that diversity is a positive, making organizations stronger and more flexible, and the drumbeat of those seeking a more "normal" Japan. Where is the appreciation for Japan's idiosyndratic path, the opportunities a "differently abled" Japan affords its allies? Different is supposed to be good, offering one opportunities to achieve goals in new, creative ways. Of course, the use of the word "normal" was facetious from the beginning. Becoming "normal" for a country with an economy the size of Japan meant becoming powerful. 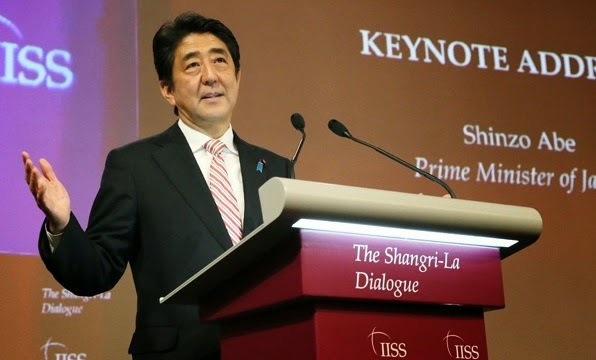 And becoming powerful is the goal of Abe and Company's still tentative but nevertheless unidirectional procession down the path of toward Japanese military flexibility. Anyone who argues otherwise is being tactically mendacious. And there is nothing wrong with Japan becoming more powerful. The United States is responsible for far more territory and far too many developments. Its commitments to its treaty allies should probably now be seen as reassuring rather than rock-solid. China seems intent on being a bad neighbor; Putin seems intent on being a villain and the Mideast, well, why would anyone want to be involved in its fratricides, except for all that lovely oil and gas? In such an environment, a stronger Japan is desirable. However, does Japan have to throw away its unique characteristics to cope with regional and global contigencies? The New Komeito and most honest brokers would say, "No." They have been arguing vociferously, desperately, that Japan does not have to aspire to normalcy -- just greater physical strength and flexibility. Source: Tokyo Shimbun, 14 June 2014, page 5. So unclear are the merits of the corporate income tax cut proposal that Mr. Koyano way out there in the far eastern section of the Tokyo Metropolitan District can only think it has been put forward as the consequence of a corrupt quid-pro-quo. Japan's Corporate Income Tax: Who Pays? So let's look at some basic facts regarding the rates of corporate income tax companies pay, courtesy the only folks who seem to ask any questions, the Japan Communist Party and its party organ, Akahata ("Red Flag"). Take the above graph, published in Akahata on April 30. Based upon data demanded from the Tax Office by JCP member Sasaki Kensho, it shows that the actual rate of tax paid by Japanese corporations varies widely according to size and is never anywhere near 35% nominal rate. Micro-companies, ones with base capital of 5 million yen or less pay effectively pay about 22%. Small- and medium-sized companies pay anywhere from 23% to 27%, with the peak in the Mittelstand range of companies with 100 million to 500 million yen in base capital. Above the 100 to 500 million yen range, the actual rate of tax companies pay drops precipitously. Egregiously, companies engaged in consolidated accounting, i.e., all the major corporations who are the names on the walls at the Nippon Keidanren, pay an effective 13% rate of tax. What rates of tax are individual companies paying? Here are some numbers, again via the JCP and Akahata. Yes, it does look bad that the fabulously profitable Toyota Motors, whose chairman Toyoda Akio is not only a loyal supporter of Prime Minister Abe (Link) but who is the only person under 60 years of age in the directorate of the 2020 Tokyo Olympics (i.e. -- the person who will still be around when the Olympics are held in 6 years's time) pays not one yen in corporate income tax. So it is the mid-sized companies who are not only paying taxes but who are paying them at a higher rate than anyone else. The big names, the ones with the exceedingly clever accounting departments, are taking advantage of every break they can get. So what the hell is this talk of reducing the corporate tax rate about? Quietly, if you ask honest members of the LDP, it is about attracting foreign investment from non-Japanese sources. Japan's corporate income tax can be seen as an invisible barrier (oxymoron alert!) against foreign corporations investing in Japan, since these non-Japanese companies tend to be based in countries where investors demand profits -- which puts them a severe disadvantage in competing in Japan against Japanese corporations whose shareholders actually like it when the company books losses -- BECAUSE THEN THE COMPANY PAYS NO TAXES. Later - In comments, Jason Mortimer provides an important rejoinder to this post, to which I have offer a short response. 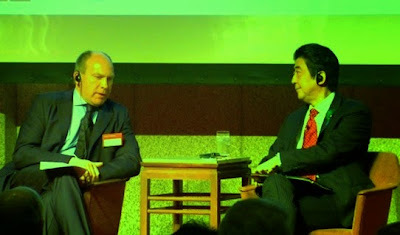 At The Economist Japan Summit 2014 conference held on the eve of President Barack Obama's visit to Japan, Columbia University Professor Gerald Curtis was assigned the delicate task of providing instant analysis of Prime Minister Abe Shinzo's keynote address (Link). Professor Curtis said much, but his main message to the PM and his team was that their movement faces a moment of truth. For the Abenomics train to keep rolling, the PM had to chose four or five big reforms right now out of the Abe and Co. potpourri of ideas, commit to this handful of reforms in a public way and then together with his Cabinet and his ruling coalition complete all work on these selected reforms by November. "Yes," I remember saying to myself at the time, "But Abe-san won't do that, will he? And since he won't, it is probably best not to ask him to. We saw how well telling him not to go to Yasukuni went, didn't we?" That is a lot stuff to just read through, much less enact. Monday, June 16 is going to be a very, very interesting day. Today is supposed to be crunch day: the day when the New Komeito decides whether to accept or reject the Liberal Democratic Party's sudden cram down of an expansion of Japan's definition of constitutional self-defense to include collective self-defense. The choice is not a happy or an easy one. The New Komeito's mothership, the Soka Gakkai lay religious (I know that that is an oxymoron. So does the SG. Hence its paranoia) organization has already expressed its opposition to the LDP's plan to reverse through a simple Cabinet Decision (kakugi kettei) the Japanese government's heretofore decades-old official position that the exercise of the right of collective self defense is unconstitutional. For the SG, the only proper path for such a reversal of a previous unconstitutional ruling is a revision or amendment of the Constitution (Link - J). For the New Komeito, surrendering to LDP pressure on a Cabinet Decision would set the party formally at odds with the SG leadership. This would, of course, do wonders for the party's longtime claims to be independent of the SG. At the same time it would be extremely confusing for the SG flock -- who vote en masse for the New Komeito because is it the political face of the SG. What is making the rounds of Nagata-cho now (and for this insight I am indebted to Michael Penn of Shingetsu News) is the idea of a snap dissolution of the House of Representatives after the end of the current Diet ordinary session. On the face of it, a House of Representatives election now poses unnecessary risks for the LDP and Abe Shinzo. The party already has huge majority in the House of Representatives reflecting the frustration and disgust the voters felt for the political process in December 2012. There is no guarantee that the voters, when given a chance at passing judgment on the Abe Administration, will not opt for independents in the district seat elections and opposition parties in the proportional seat elections. Yes, the polls numbers for the LDP and for the Abe Cabinet are fantastic and the opposition parties abysmal -- but as the House of Councillors election in 2007 showed, the public has the power to clip Abe Shinzo's pretensions of political mastery. A snap election for the House of Representatives does, of course, nothing to change the seating arrangements in the House of Councillors. The break ups of the Your Party, the disgrace of Watanabe Yoshimi and the division of the Japan Restoration Party into two have only complicated, not eliminated, the possibility of a crafting of a Hawk-Hawk-Hawk (add as many Hawks here as you like) coalition in the House to replace the existing Hawk-Dove LDP-New Komeito coalition. The argument for the prime minister dissolving the House of Representatives is compelling. Given the thuggishness of reversing a government constitutionality ruling by fiat, the Abe Cabinet will be searching for a means of justifying its actions. A snap election, with the certainty of a strong, possibly entirely extirpating, victory of the LDP over its scattered, fissioning and puny opponents, would demonstrate, according to Abe, the LDP and the Yomiuri media empire, that the public strongly supports the Abe Cabinet's behavior. Of course, an LDP victory would not be a virtual referendum on the party's policies. It would be a reflection of the current pitiful state of the opposition parties. In a true referendum, such as the one that a revision of the Constitution would require, the voters would get the chance to choose between "Yes" and "No." In the whispered-about snap dissolution and general election, the choice would be between "Yes" and "Nothing." The further arguments for a snap election are an increase in the LDP's freedom of action and a coverup of the Abe Cabinet's continued fecklessness as regards structural reform. 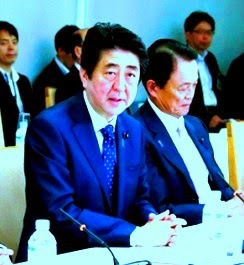 The LDP's rank-and-file, the young and militant mass of Abe Shinzo acolytes that Machimura Nobutaka finds distressing (Link) are not wrong in wondering why, in the face of polls showing support for the LDP in the 40% range, the LDP has not ditched its coalition with the cautious New Komeito. The relationship does seem an artifact of another time -- when the long term trend in voter behavior was away from the LDP, despite all the financial rewards being dangled, toward alternatives (the 1993 opposition coalition, the New Frontier Party, the Democratic Party of Japan, the Nippon Isshin no Kai, et cetera). for the wild things in the party the obvious choise is to force the New Komeito to chose one way or the other on a Cabinet Decision -- and if they balk, dump the coalition and go to the public for its response. After the victory, the party could roll up its sleeves and set to work on really remaking Japan, free of the New Komeito's annoying obstructionism. What better time then, to turn around to the rest of the world with a defiant, "What? You don't like it? Well, we asked the Japanese voters and they love it!" So what is the likelihood on this Friday morning of Abe and Friends going through with a virtual referendum after the end of the regular Diet session? Incredibly, I am thinking they are 50-50. Later - Jiji is reporting that the New Komeito is looking for a duplicitous out smudging the line in between individual and collective self-defense (Link). Wish them luck -- given the time frame on coming to a decision on specific scenarios, New Komeito negotiators will have no opportutinity to coordinate their positions with the Soka Gakkai directorate. Funny thing about going to places rather than just reading about them is that by just walking around one can learn that which one should perhaps have known but never came across en la vie virtuelle. Take for example the fine vessel pictured below -- which one can come across if one takes a walk around Sydney's breathtakingly glitzy Darling Harbour. With its shark teeth bow and camouflage paint job, it fits right in with the French fountain display, the graphic laser and 3-D light shows playing across all the buildings at night, the casino and every ersatz high brow, demeaning and incredibly high-priced tourist trap one can imagine. The S.S. Sam Simon is the fourth and most recent addition to the Antarctic expedition fleet of the Sea Shepherd Society. That one would see this vessel berthed in Australian harbor should not surprise one. After all it was the Australian government that filed the successful International Court of Justice case against Japan's JARPA II Southern Ocean research whaling program. 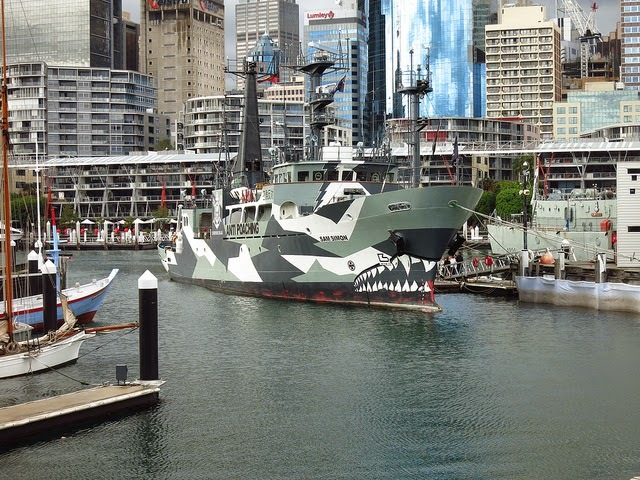 What is surprising for a dweller of the northern hemisphere is where the Sam Simon is berthed: the pier of Australia's National Maritime Museum. To the right of the Sam Simon is the stern, for example, of the retired H.M.A.S. Vampire, the last of Australia's big gun warships and a part of the Museum's permanent collection. 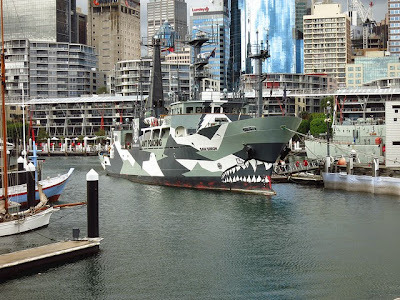 It is not as though the relationship between an official Australian national museum and Sea Shepherd is a secret (Link). Nevertheless is is freakish that one buys the ticket to tour an ostensibly piratical vessel at the ticket booth of the museum built to commemorate Australia's water-borne heritage. Australian sympathies as regards the killing of cetaceans are on display at the Museum. It is hosting not one but two exhibitions on whales, while in its little theater the Museum is running a National Geographic produced documentary on dolphins. Do not call it overkill. The other facet of the story I did not know -- and which shows either Sea Shepherd's delicious sense of irony, its appreciation for fine ship engineering, or both -- is that the Sam Simon was built in IHI shipyards for the Japanese government. Completed in 1993, it was christened the Seifu Maru (清風丸) and was -- and this is where the irony gets thick -- a scientific research vessel under the control of the Japan Meteorological Agency. It was decommissioned in 2010, bought in a private sale and reemerged on the oceans as the Sam Simon in 2012. So in the Sam Simon we have a Japanese scientific research vessel, once used for actual research (in a curiously brief 17 year career) careening round the southern ocean pursuing and impeding the actions of the vessels of Japan's highly subsidized and completely bogus research whaling program. Looking upon the Sam Simon, embraced and celebrated by the organization tasked with preserving Australia's ocean-going lore, and upon the bottomless punchbowl party of the Australian economy of the last 20 years, turbo-charged as it has been by China's voracious demand for Australia's minerals and hydrocarbons, one senses that whatever Abe Shinzo & Company's plans may be for a union of maritime democracies to resist Chinese expansionism in the Western Pacific, getting Australia on board is going to be a daunting, if not a futile, task. Which illuminates the scary stupidity of the Abe Cabinet's not telling Minister Hayashi Yoshimasa to just shut his mouth about a restart of a reformed JARPA II and its not telling Minister Amari Akira to stop dribbling the ball and just shoot for the goal in the Trans Pacific Partnership negotiations. Later - And in the more immediate future, Abe-san should not be stupid and offer Soryu-class submarines (Link) at a discount "because we're friends." Make the offer to Mr. Abbott at full retail price; it's all Chinese money anyway. 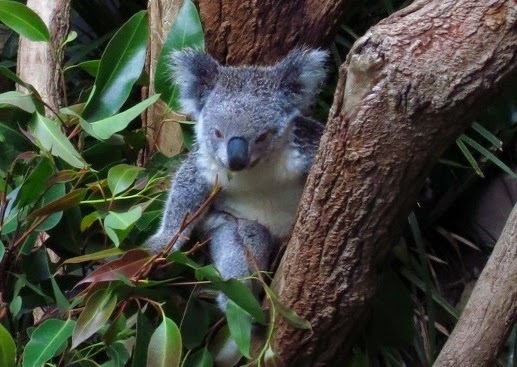 MTC is away from his desk, annoying the marsupials. - the looming Third Arrow announcement, Version 3.0. In our future, the highway to peace and prosperity rolls out wide before us. Our responsibility to the next generation is to bring this region's potential for growth into full bloom. So once again, Japan for the rule of law. Asia for the rule of law. And the rule of law for all of us. Peace and prosperity in Asia, forevermore. - He is for rapid and dramatic increases in the percentage of women in corporate management, and has set a goal of reserving 30% of all government positions for women. -- He has ordered a massive build out of child care to eliminate waiting lists. -- His government is considering eliminating the deduction for non-working spouses, which will encourage (force?) a movement of Japan’s highly trained but underemployed women into the work force. - His government has warned the sprawling and electorally powerful agricultural cooperatives that their days are numbered. - He replaced a conservative governor of the Bank of Japan with a radical bent on creating 2% inflation, no how lousy the BOJ’s portfolio becomes. - His government is confronting the issue of the mistaken transfer of wealth from the young to the old even though seniors vote in vastly greater numbers and may punish his party at the polls. - His government and party have approved massive fiscal stimulus bills in the face of daunting government deficits and national government debt. - He is a strong advocate for labor immigration, setting a target of 220,000 new immigrant worker arrivals per year ad infinitum. - He browbeats corporate managements for their stinginess in paying their workers and their failure to offer more permanent employment positions. - He speaks about "proactive pacifism" -- not just the defense of Japan but greater participation by Japanese forces in the defense of others. Sure he has some legacy issues -- Yasukuni, history awareness, education, the Special Secrets Protection Act (which, upon reflection, should be called the "Protection of Lying Ministers From Embarrassing Revelations Act"). Sure he still listens to and employs some out-and-out-idiots (Link) and has a Nigel Tufnelesque hard time discerning stupidity from cleverness. Sure he is way too close to some corporate empire builders. However, in a world where demagogues offering nativist, isolationist, oligarchic, constrictive and violent solutions to problems, Abe is rowing hard in the opposite direction. Indeed, with President Barack Obama crippled by his low popularity and the likely loss of control of the U.S. Senate to the Know-Nothing Republicans, Abe Shinzo should perhaps now be considered the standard bearer of liberalism around the world. Prime Minister Abe Shinzo (from his seat, as Okada Katsuya, who has the floor, is about to change the subject) - “You just don't understand, do you?" Okada Katsuya - "I don't understand? I think it is you, Mr. Prime Minister who do not understand. You are rude, using that phrase. Saying,'you don’t understand' is rude. When we look over the official record we will clearly see who is the rude one-- who is the one who does not understand. We will take this up some other time. You are the prime minister of the whole country and all its citizens. I wish to offer to you most humbly my thought that when no one is asking you to speak, your shouting out a heckling expression is not something that as a prime minister you ought to be doing." I would rather think the answer to the question "What's happened?" would be "Wednesday." Wednesday, May 28, 2014, to be exact. 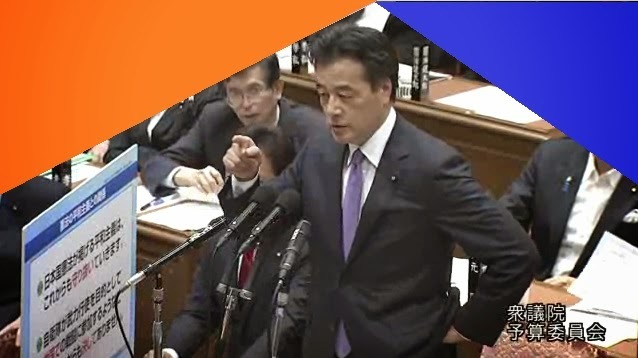 While great for television -- the above exchange being one of the testier and more entertaining moments -- the session was pretty grim for the government and the LDP. "Train wreck," "fiasco" and "flaming heap of parrot droppings" are just some of the phrases that come to mind regarding Abe's and Cabinet Legislation Bureau chief Yokobatake Yusuke's performances. Nobody, in other words, was cheering. However, moving as Komura says he wants would provoke an unnecessary collision with the New Komeito, ending with the collapse of the ruling coalition. The sudden chaos would overwhelm the government's all important third try, after two damp squibs, to launch a set of Third Arrow structural reforms -- ones in which international investors and the international news organizations can finally place their faith. Even for a man of action and turmoil from Choshu like Abe Shinzo, Komura's gambit should seem overwrought and unwise. * An instance of what Tobias Harris refers to as "a momentary lapse into reason." Both Kiuchi Takatane and I would probably like to have a word with the session's photographer. The FCCJ has posted a full video record of the event on YouTube (Link). I would suggest that the session is a bit easier to consume as a purely auditory experience - i.e., click on the link, then open another a window on your browser to something more pleasing to the eyes, like let's say, this. - What ultimately sank the Koizumi initiative on normalization was not a loss of public support for engagement with Pyongyang. It was the Japanese government's reneging on the agreement to return the living abductees to North Korea after a series of family visits. By keeping the five, deprogramming them and allowing the abductee lobby to use them as cudgels against the DPRK (and against any post-Abe government that tried to circumvent the abductee lobby to engage Pyongyang) Japan taught the DPRK a lesson in bloody-minded double-crossing -- something that Kim Jong-il thought he knew everything about. - After Iijima Isao paid his very public visit to Pyongyang (Link) the chattering classes in Washington and New York mocked him, saying he had been used as a propaganda tool of the North Koreans to no gain. For that derision there has been no apology, nor will there be any. Furthermore, Iijima's lesson on how one gets the ball rolling with the DPRK will be ignored. - While support for the abductees is wide, one should not be too certain of its depth. Like the current emnity for Chinese and South Koreans (distinct from emnity felt toward the Xi and Park governments) outrage over the abductees is mostly a pose, a feeling one is supposed to feel. A maudlin minority of miscontents and dupes shows up at abductee events. In public opinion polls, the majority of voters express inextinguishable anger. Altogether, though these items do not add up to much in the way of a public movement. - Ergo: there is no public to punish the Abe 2.0 Cabinet if this initiative fails to bear fruit. The abductees issue is private business, owned by a coterie of Diet members of which Abe Shinzo is a charter member. The issue has been managed for the purpose of humiliating and boxing in administrations, this in order to pave the way for a return of a revisionist government. That the person in charge of that government is Abe Shinzo, the man the abductee issue first made prime minister, pretty much guarantees that when the Pyongyang investigators find nothing new, the response in Japan will be a dull thud.